The skin on your body is the largest organ of the body. It is our very first barrier of defense against everything. If you are like most people, you want to keep your skin smooth, supple and healthy. This can be achieved through a diet rich in antioxidants. A topical skin care regimen with antioxidants as a key ingredient is also very important. Antioxidants are nutrients (vitamins and minerals) and enzymes (proteins inside your body) that can help to prevent and repair damage to your body’s tissue. They are able to do this by slowing or preventing the effects of free radicals. 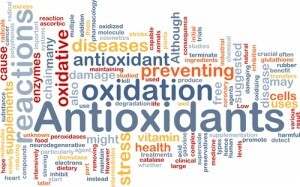 Free radicals start the oxidation process, a process which causes damage from oxygen that can lead to cell dysfunction. An example of oxidation is browning of an apple. Free radicals are frequently blamed for everything from the aging process to the degradation in heart health, immune response, diabetes and Alzheimer’s. Thankfully, a diet rich in antioxidants can step in to help render free radicals neutral. As antioxidants block the effect of free radicals, they end up being oxidized. That’s why it is essential that you supply your skin on a daily basis to help support the constant attack on your skin from aging changes and environmental damage. You will find antioxidants in food like fruits, vegetables, nuts, grains, some meats like poultry and fish and teas. Carrots are rich in beta-carotene, Tomato’s are an excellent source of lycopene and Vitamin C and fish contains Omega 3 and DHA. You can also take oral supplements to get your recommended daily allowance of antioxidants. When it comes to caring for you skin, antioxidants can help protect your skin from the damaging effects of the sun and environmental stressors. Unlike sunscreen and moisturizers, antioxidants can help protect your skin from the inside out by guarding your cells from damage. Vitamins A, C and E are thought to be particularly important in your skincare. They help in fortifying cells against harmful free radicals. This is very helpful to the skin, which is constantly shedding and growing cells. For this reason, any antioxidants that protect cells and encourage cell growth could be helpful in an anti-aging regimen. These antioxidants can be absorbed thru intact skin so it is important to use topical skin care products that have these as key ingredients. Anti-inflammatory Properties: antioxidants such as alpha lipoic acid, bromelain (found in Pineapple) and polyphenols found in pine bark and green tea which help produce valuable anti-inflammatory properties by increasing circulation and cell metabolism. Reducing inflammation promotes even skin tone, helps with acne, and keeping fine lines and wrinkles at bay. Firming: antioxidants may actually reverse the effects of aging by improving skin health and rejuvenating it’s appearance. Coenzyme Q-10 or CoQ-10 is a common firming antioxidant that is great in eye creams and products that are meant to tone skin. Reduce appearance of wrinkles: although it is nearly impossible to make wrinkles disappear, skincare products with antioxidants can plump out the skin and make it more youthful. Antioxidants such as Vitamin E (boosts collagen) Green Tea, Vitamin C, Niacinamide, Coffee Berry and Vitamin C are great for reducing the appearance of fine lines and wrinkles. Cabbage is a powerful source of indole-3-carbinol,a chemical that boosts DNA repair in cells and appears to block the growth of cancer cells. 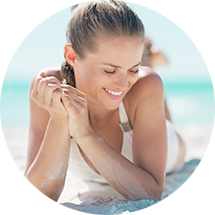 Repair of sun damage: we all know that too much sun can be dangerous and leads to skin cancer, but it’s also bad for your skin’s appearance (ie: drying out & damaging cells). Sun damage can cause havoc on the skin in many ways. Antioxidants that stimulate blood flow, such as Lutein, can help encourage the growth of new cells and make sun damaged skin appear younger. One way to achieve healthier skin is to plan your meals around the ingredients that will give you the benefits you are looking for. You will also want to build a skin care regimen around products that contain antioxidants as key ingredients. Cosmeceutical products (such as SkinMedica) that are dispensed through a physicians office are usually much higher in the active ingredients your skin needs than those purchased through department stores. 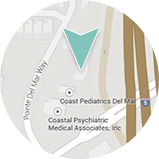 For more information about how to incorporate antioxidants into your daily skin care regimen, or to schedule a complimentary skin care consultation please contact Dermatology & Laser of Del Mar at (858)350-7546.